Overland Park, KS - November 7, 2017- Online retailer OpticsPlanet has awarded BLACKHAWK!, leading manufacturer of high-tech holsters and tactical accessories, Best Tactical Holster in its 2017 Brilliance Awards. 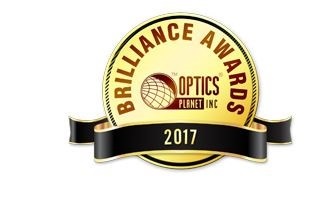 Decided by popular vote, the Brilliance Awards annually recognize the best of the best in performance optics and shooting equipment. OpticsPlanet named the finalists vying for the right to bear the coveted Brilliance Award seal. Consumers then cast their votes, choosing the BLACKHAWK! Omnivore Holster for Streamlight TLR-1 and TLR-2 weapon as the best tactical holster on the market. Multiple holsters for multiple handguns is no longer an issue. The BLACKHAWK! Omnivore is a multi-fit holster that accommodates more than 150 styles of semi-automatic handguns with an accessory rail. The active retention mechanism doesn’t wear the handgun’s finish. It locks onto the frame of the light in the Streamlight models. A thumb release disengages the locking mechanism when drawing the handgun. The Omnivore represents the future in retention holster technology, and delivers unparalleled firearm access.